Normal fabric wear from being worn and washed. These two Schmidt Workwear shirts are in excellent condition. No stains or holes. All buttons are attached and are in excellent condition. We try to respond as quickly as possible. We strive to take the best quality photos as possible. Pit to Pit (Across Chest):33" (83.82 cm.). Features: Long Sleeve/Button Front Shirt, Button Down Collar, Single Chest Pocket, Plaid Pattern. Sleeves(Top of Shoulder Seam to Cuffs): 25" (63.5 cm.). Material: 60% Cotton/40% Polyester. Armpit to Armpit: 27 ". Sleeve Length: 26 ". Shoulder to Shoulder: 22 ". Material: 60% Cotton / 40% Polyester. Size: XL, X-Large. Sleeve Length: 10". Color: Beige, Green, White. Chest: 25". Back: 30". Sleeves: Short. Material: 45% Cotton & 55% Polyester. Color: Blue, Green, Black & White. Buttons: Tan Swirl. Style: Button Down. Armpit to Armpit: 28". CE Schmidt Workwear Shirt. Flap Snap Pockets. western Aztec. Shoulder Seam to Shoulder Seam: 21.5 in. Center Back Neck Collar Seam to Hem: 31.5 in. Brown tan orange. 80% Cotton 20% polyester. Button down long sleeve. Shirt is in very good, pre-owned condition (no stains, fading, tears, pilling or holes.). Great New Blue/Black Plaid >> C. E. Schmidt Work Wear >> . SS Shirt. button collar, plain chest pocket . Colors are red with black, gold and white accents. Minimal wear from laundering - no stains, holes or tears noted. Across chest - 26". Shoulder seam to shoulder seam - 21". Length - 32". Nice crisp colors in red, white and blue. Great for many occasions. Length (back collar to hem): 31.5”. Sleeve: 24”. 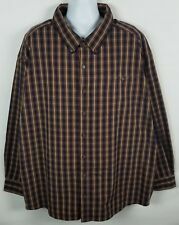 CE Schmidt Workwear mens heavy weight cotton plaid long sleeve work shirt....size 3XL...great condition....free shipping! Button Down Collar. One Patch Pocket. Three Extra Buttons Attached. Care: Machine Wash Cold. Pattern: Plaids & Checks. Material: 100% Cotton. Color: See Pictures. Pit To Pit = 23". Great Condition. Sleeves = 24". 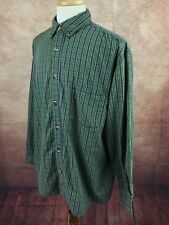 The fabric is a cotton poly blend, it is a plaid with olive green back ground and has blue, red & white stripes running through it, it is in excellent used condition. It is from my daughter's house which is smoke free. Shoulder to hem approx 31.5". Single chest pocket. Long sleeve with single button barrel cuff. Button down collar. Fabric: 100% Cotton. Length: 31". Condition: Preowned in good condition. No stains or blemishes.